A major concern for many staff is getting the balance right between being warm, friendly, human, normal with patients – and crossing boundaries. What if the relationship gets too close? This can mean firstly the patients gets too close to you or you get too close to the patient. The problem here is what does ‘too close’ mean. The nurse/professional carer role involves being physically and emotionally intimate with patients. This is an essential part of care and must be based on trust and respect – we know this. But we’re saying that we need to have relationships with patients, however brief, and these maybe difficult. We need to know where we are. Accepting several payments from a patient. The other issue is the sexual one. The NMC has a zero-tolerance approach to sexual activity with patients, so will your hospital Trust. Disney says safety first and that means safety of staff as well. 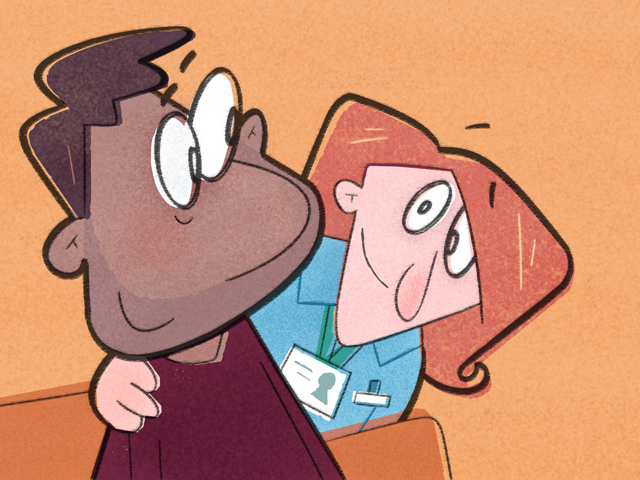 It’s usually clear when a patient approaches you sexually either verbally or physically. Do get advice and help from appropriate senior staff if this happens to you. BUT what about when a health professional gets ‘too close’ – what is too close? Clinically unnecessary communication – includes texting and Facebook!! Repeatedly engaging in conversation about personal sexual matters unrelated to treatment. In short disclosing personal information (this doesn’t include your name, but beware of Facebook); accepting gifts (this doesn’t include the box of chocolates given to the ward); going on holiday with patients and engaging in sexual activity with patients are ‘too close’. The most important thing about responding to this sort of question, is, perhaps, not the words staff use, but the tone of their voice and the expression on their face. If they smile and say something gently, or humorously, most patients will understand and accept that the member of staff can’t answer the question. Thanks for being interested, but I don’t think that knowing about my experience will be any help to you. I’m sorry, but that’s a bit too personal for me to talk about. Is there a particular reason why you’ve asked that? An invaluable ploy in situations where staff are asked a difﬁcult question is to buy some time. A patient will appreciate that staff are taking their question seriously and courteously if something like this is said: ‘Hmm. I’ll need to think about how best to answer that. Can I get back to you on that one?’ This will genuinely give you time to think about how to respond, and also to consult a colleague. Q. 1 What phrases do you use, or might you use in future to respond to personal or uncomfortable questions? Q. 2 How do you think mind-awareness helps when a patient asks you a very personal question? – What do you know about the patient’s past experiences (e.g. having been abused or bereaved) that might explain more about the purpose of the question? – Is there a more hidden, important, underlying reason why they’re asking that question? – What is their body language saying about how they’re feeling at this moment? Is it aggressive? Withdrawn? Distressed?